Lesjöfors in Tinglev is well-known for delivering very clean springs. This is very important for many of our customers' applications where springs are required. 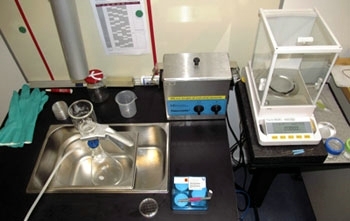 We have recently invested in new testing equipment in our lab. This makes it possible for us to perform several tests for our customers that external partners were contracted for earlier. This means of course a shorter expedition time which our customers benefit from. Normally we make springs with very tight tolerances, but we have also succeeded in making springs in a way not meant, but needed for a customer; we can make springs that are leaning, with tolerances. We have also invested in new software for PPAP documentation that gives us a smarter way of working with PPAP. Our employees are our most important asset. We have started training for some of our staff to become “Industry operators”, a training program that secures our position as one of the leading spring producers in our business area. Also, we have just undergone environmental inspection and we passed the inspection without comments. One of our customers is implementing a forecast system, which eliminates some of the normal manual work tasks. We are working in close corporation with our customer with this, and the result will be that the whole process, from forecasting in one end to payment for the springs in the other end, is electronic and with a minimum of persons involved. Lesjofors Tinglev and LINAK have had a fruitful cooperation for many years. LINAK is a world leader in electric linear actuation, developing electric linear actuators and actuator control systems used in a variety of applications. LINAK is working on the world market and is competing with quality and total cost prices. Lesjöfors Tinglev has for many years delivered a spring for the European market, and LINAK has purchased the spring for the American and Chinese Market in China. 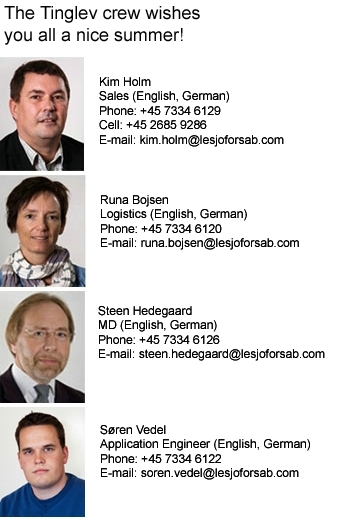 Lesjofors has now developed a special process tool, to be competitive also in these markets with the particular spring. Lesjöfors Tinglev is now delivering springs from Tinglev to China and America, with the well-known Lesjofors quality and value for money. Delivery performance is measured by too early, too late and quantity. Weeks 28, 29, 31 and 32 open with reduced staff. Open during the summer holiday period with reduced staff. We have factories or sales offices in twelve countries: Denmark, Sweden, Norway, Finland, Germany, Slovakia, Russia, Great Britain, Holland, Latvia, Korea and China.